I am restoring an old cabin that I live in. 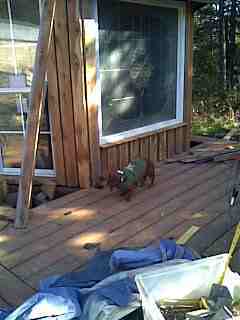 I find it great to see a project completed - my deck is especially ego boosting. Each piece of wood is specially cut to fit my design - which took a lot of concentration. Also - helping others helps me realize that we all have problems. I attend AA meetings weekly and the 12 steps helps me realize that it was not fault, and the best course of action is healing the past and forgiving the person that harmed you. Not easy to forgive, but the only ways to become a happy person is forgiveness. Darlene's comments to The Lighter Side contribution titled "I Build Things" can be found at Comments below this submission. Depending on system activity, there are sometimes delays in comments going live on my site; but rest assured, they do eventually appear. So if you don't yet see them, I hope you will return later to read what I, and possibly others, have written. I thank you for your patience and understanding.